For anyone starting school in the 1960s, whether in Britain or the USA, one of the most exciting subjects covered in the classroom was the space race, as the USSR and the USA vied to land the first man on the moon. Children in the West were taught that the Russian-led Soviet republics were the "evil empire" and that it was important to the safety of the world that the United States of America got there first. Meanwhile the Soviet curriculum said the opposite. But, wherever they went to school, the kids also learnt that many of the innovations of the age, like the door that opened itself when you walked up to it in the science museum (or in a few large branches of Sainsbury's), had only been discovered as scientists overcame new challenges to enable the moon mission. This made space-related toys the must-have presents for Christmas and birthdays. The more intricate and scientific looking they were, the better. 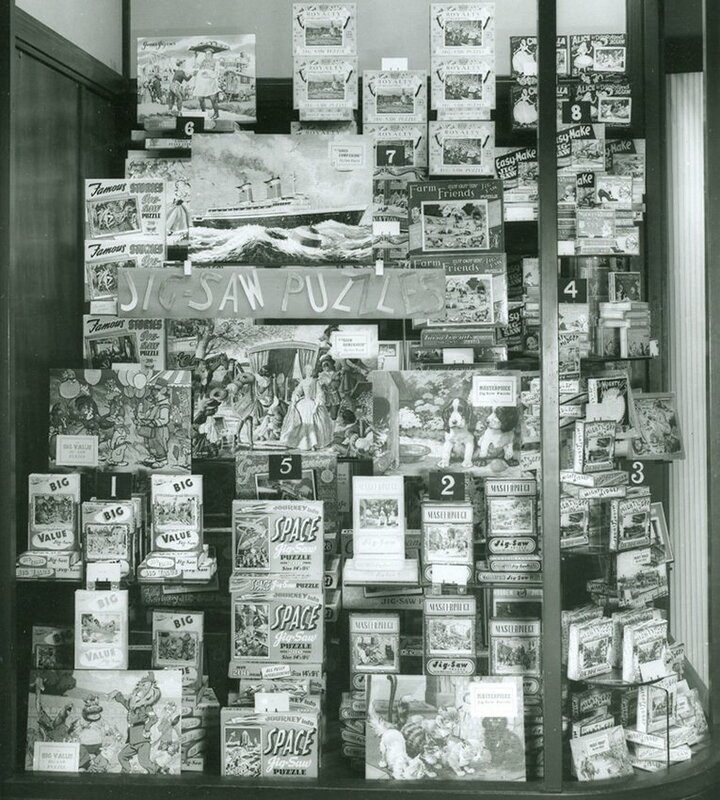 Woolworth was quick to see the potential and stacked its counters with all manner of temptations, from accurate scale models of the lunar craft to board games that allowed kids to go on a moon mission of their own. Anyone lucky enough to keep their original boxed toys, rather than testing them to destruction as most kids do, will have a sought-after and highly-prized collectable today. On this page we take a look at some of the best sellers, and the public relations effort that went into buddying up to the space programme to make Woolworth appear to be a thoroughly modern retailer. Since the earliest times children have dreamt of aliens and outer space - and flying to the moon. The V2 rockets of World War II brought this dream one step closer. The Fifties and Sixties saw intense competition between the two global superpowers - the USA and USSR - to master space and land a man on the moon. Coverage of the story in cinema newsreels, on the radio and via the new mass medium of television made space travel a hot topic at school, and a key theme for toys and games in the shops. 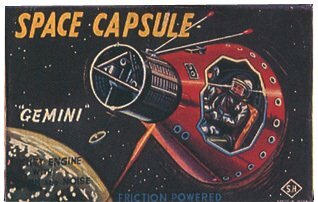 Kids' obsession with the space programme spawned many products, from tin toy rockets and colouring books to a wide selection of jigsaw puzzles - initially based around science-fiction comic strip stories, and before long showing the prototype craft and the heroes of the space programme as it took shape. 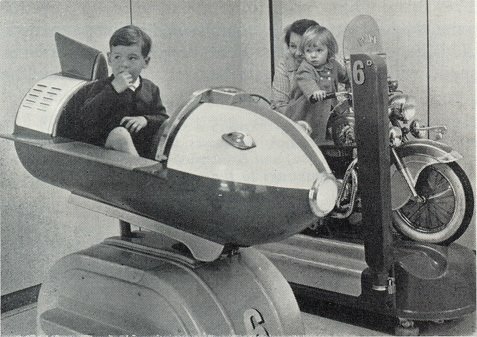 Building on the opportunity, before long Woolworth replaced traditional horseback and motorbike kiddy ride machines with space rockets. For sixpence (2½p) little boys and girls could be transported to another universe ! 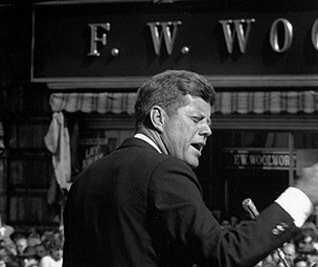 Speaking in 1961 US President John F. Kennedy accelerated the space race, challenging America to land a man on the moon before the decade was out. To achieve that goal would require new fuels and new materials that had yet to be invented. The speech mobilised scientists and became the catalyst for many innovations that have since become commonplace. Satellite communications, microwave ovens and fibre glass all took shape in the 1960s. Today it is hard to comprehend that the total computing power behind the moon mission, both on board the Saturn V rocket and back at mission control, was less that that of a typical mobile phone today. At the time the five gigabytes of storage that holds this website would have filled several office blocks rather than a fraction of a three and a half inch (8.5cm) hard disk! 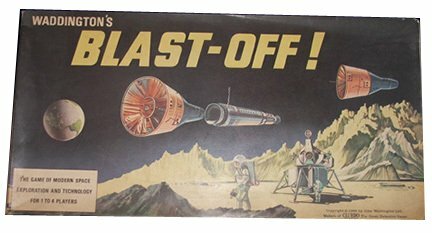 The Apollo Missions were the inspiration behind many of the toys that appeared on the shelves at Woolworth's, from board games like 'Blast Off', illustrated below, to models of the lunar craft which were either pre-made or available in kit form to build at home . 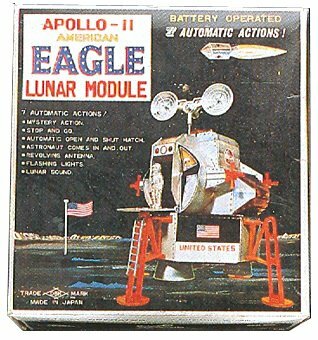 Many dads and lads spent the winter evenings of 1969 assembling their very own Apollo 11 - the must-have present that Christmas, while others opted for a tinplate model of the Gemini landing craft. Another Board Game with a space theme was Triang's 'Moon Probe', which was a big hit in 1968 as a preparatory Apollo 10 mission headed to the moon, orbiting to the dark side without landing. Meanwhile another innovation - the View Master, which was a three dimensional slide viewer, captured the imagination of many families. Clever design and marketing had inspired many circular image cartridges on various subjects from travel to natural history, cartoons and legends ... and, of course, the Apollo Programme. 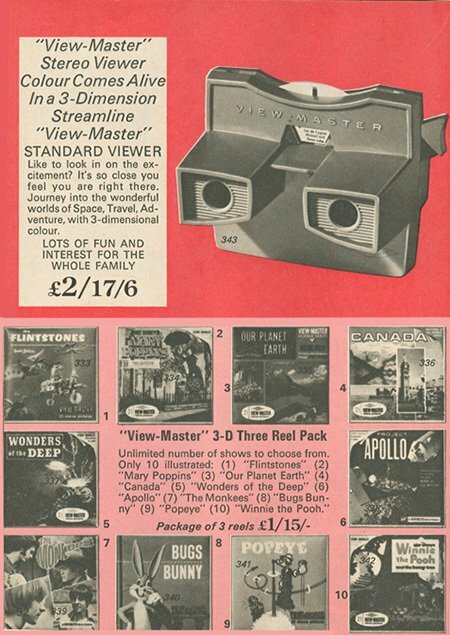 The viewer was supplied complete with an assortment pack of cartridges for two pounds seventeen shillings and sixpence (£2.87½p), the equivalent of £39.47 or US $50 today. A pack of three additional cartridges cost one pound and fifteen shillings (£1.75). 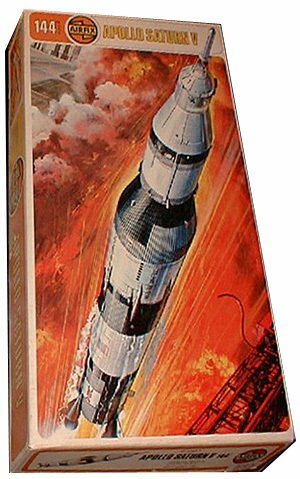 The top seller was a 1:144 scale model of the Apollo Saturn V rocket, marketed in the UK by Airfix. Even at this scale it was still huge compared the supplier's regular array of model aeroplanes and battleships. For British kids another craze partly inspired by the space programme challenged the moon mission for the top slot. 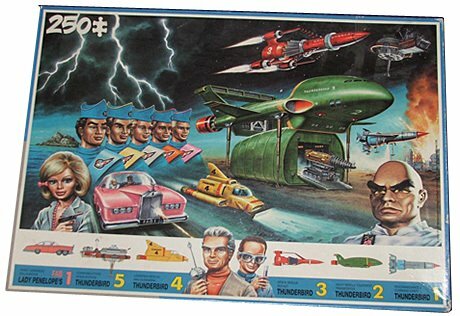 Gerry Anderson's Thunderbirds embraced the spirit of the age, mixing elements of sci-fi, action heroes, spy thrillers and jeopardy to create a must-watch TV series which won viewers around the world. The legendary pupeteer's space rockets were Apollo-like. while the launch pad included a standard lemon-squeezer, which it is said that the modellers had obtained from the Woolworth's kitchen department! The production team captured the imagination of a generation and were one of the first to see the merchandising opportunity that this presented. The Thunderbirds franchise embraced everything from Fab Ice Creams by Lyons Maid, to models of each of the craft, dress-up uniforms, board games and even jigsaw puzzles. Unlike many sixties fashions, the range has lived on, even spawning feature films in the 21st Century. For many parents the stuttering marionation action of the puppets in the original ATV series had a magic quality which the slick CGI graphics were unable to replicate. Fifty years after the original transmission Geoff Tracey, Lady Penelope, Parker, Scott and Vergil and even The Hood have their own immortality and never get older! The original Airfix Model of Saturn V was such a hit that it regularly returned to the range on the shelves of Woolworths stores. Thirty-five years after the launch, over 40,000 models were sold in a fortnight as a spot buy for a half-price toy sale in July 2004, which also proved the enduring appeal of Supermarine Spitfires, 64 years after Woolies staff had bought a a pair for the RAF at the height of the Battle of Britain. Airfix and its great designs has outlived the retailer than pioneered its products in the years after World War II. To complete the story, Woolworth Executives in New York pulled off a major coup, pre-booking advertising slots across many newspapers around the world to record the Company's appreciation of their ninetieth birthday present - the moon landing. The advertisement recognised all three astronauts, Neil Armstrong, Michael Collins and Buzz (Edwin) Aldrin. Between 1969 and 2009 the Woolworth companies in the United States of America, Canada, the United Kingdom and Germany sold more than a million items relating to the moon landing, from Super 8 and 35 mm cine films to Viewmaster Reels, models, dressing up outfits, Airfix kits and jigsaws to DVDs and console games. Planet hopping, shopping at a Woolworth's store." Little did they know that within thirty years the American and Canadian stores back on earth would be gone, with the British High Street chain following just a decade later. Today a trip to Germany, Zimbabwe, Mexico or Barbados is required just to visit Woolworths, and trips to the moon remain a distant dream.